I regularly have lip issues and I think I was able to narrow it down to a lip product, but not a ingredient yet. Each time my lips had a reaction, I would desperately search for a better lip balm. So far, I've found many great choices but I've gone back a couple over and over again. Lip products have always been my favorite and lip balms are oddly one of my favorite things to look into. My number one choice for day and night is the Bite Beauty Agave Lip Balm. I've tried the lip mask and finished a whole tube, but the lip balm version is so much easier for me to whip out and use. It feels thick and moisturizing without adding too much shine to my lips. It also keeps my lips moisturized all day long with minimal reapplication. Unfortunately, it does run out on me pretty quickly. I think I can get about 3 months out of one tube and I'm almost done with my second one. This is definitely something I'll need to stock up on during the Sephora sales so I can always have one on me. For mostly night time relief, I love slathering the Nuxe Rêve de Miel Ultra-Nourishing Lip Balm all over my lips. I don't actually slather it on though since a tiny amount is definitely plenty for my lips. It's more wax based and so there's also minimal shine. I feel like it doesn't sink into my lips as well as the other products I'm going to mention in this post though. I do wake up with soft and smooth lips in the morning though. It's also one of the balms that soothed any irritation my lips would feel too. When I came back from Las Vegas, this lip balm was pretty much my savior at night since my lips felt pretty damaged from the heat and dry weather. I'm also only my second tube of this balm! The next two are relatively new, but they're already pretty firm favorites. The Lucas' Papaw Ointment contains so much product in one tube that I'm probably never going to finish this. This ointment is really thin, but really works to stay on and moisturize my lips. I also put it on my cuticles since they've been dry, but I 100% understand why people have always raved about this ointment. There is a bit of shine when I apply it, but that's fine with me. Lastly, the Clarins Instant Light Lip Comfort Oil in Honey and Red Berry are something I've been keeping in my bag at all times. I'm a fan of the regular Instant Light Natural Lip Perfectors and so I decided to start with the oil version in Honey to see if I would like it. Once I got it, I immediately bought the red tinted version to add some color to my lips on my lowkey makeup days. I've also become interested in glosses and so these oils have also satisfied that urge to buy more glosses that I probably won't use. These oils do feel thick on the lips, but in a good and comfortable way. Like glosses, they are kind of tacky. I also have a couple more lip balm / moisturizing lip products that I do adore and rotate around, but these current 5 products have been with me non-stop just in case my lips start to feel irritated and dry again. What balms have you been loving lately? 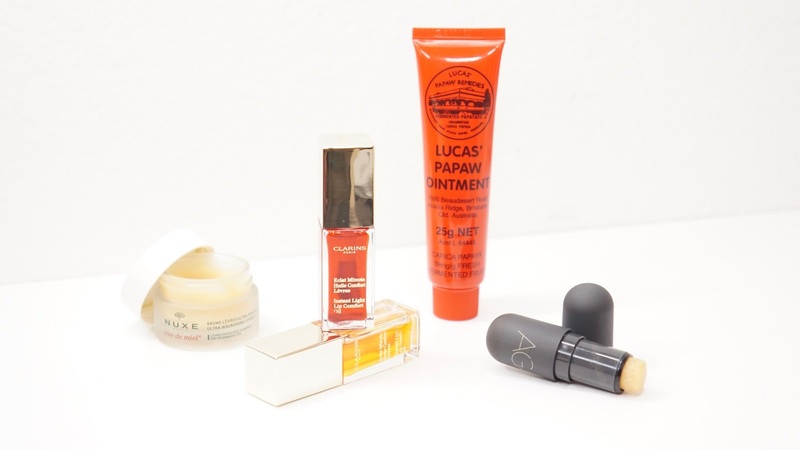 Have you tried any of these moisturizing lip products?